There are many ESL classroom and cultural sensitivity issues that teachers must address to ensure they are delivering language instruction without prejudice, discrimination, or bias. By understanding the potential problems with cultural sensitivity, teachers can avoid creating an English-centric classroom while increasing their students' language skills. One of the biggest unintentional biases teachers of ESL students must face is the assumption that when a student does not understand the English language, they must automatically not understand the classroom material being delivered in that language. This myth can lead to high achieving students being deemed lazy, unmotivated, and unintelligent. In many non-English speaking cultures, students are brought up with more passive behaviors when interacting with adults. 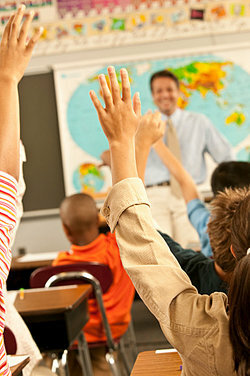 An ESL student may be less willing to approach a teacher for extra help or tutoring. This can lead to a cultural bias and assumptions that non-English speaking students are less intelligent than their native English speaking peers. At the same time, non-English speaking students can quickly absorb cultural biases against English speakers as they witness a more driven, ambitious educational community than they may be accustomed to. This may lead students to be even more reserved, hampering their language skills even further as they refrain from asking for assistance when needed. A well balanced ESL curriculum will help both students and teachers overcome preconceived notions about different cultures to create a learning environment where all students are valued for their unique heritages. One of the biggest problems ESL teachers face is that one ESL classroom may be filled with students from many nations, even if, for example, they are all Spanish-speaking countries. The cultures of Ecuador, Peru, Argentina, Columbia, and Mexico are vastly different, and teachers should not assume that students who share a common native language will share similar cultural backgrounds. Even students from different regions of the same country will have different cultural beliefs and traditions that should be honored and preserved. The first step toward ESL classroom and cultural sensitivity agreements is to create a learning environment that recognizes students' different cultures in a meaningful way. Classroom rules should be posted in all appropriate languages. Decorations such as country maps, flags, and pictures of prominent leaders can bring a taste of each nation into the ESL classroom in a positive way. Students should be encouraged to work with others from different cultures. Savvy teachers can arrange group projects designed to encourage students to share and explore one another's cultures. While each project will require students to reinforce and practice their English language skills, they will also get a comforting taste of home as they share their background with their peers. As students learn to compare their old culture with their new culture, they can gain an appreciation of both without minimizing or denigrating either culture. The goal of ESL classroom and cultural sensitivity practices should be to impress upon students the value of embracing and understanding their new culture while still celebrating their old cultures. Inviting guest speakers who have successfully integrated into the new culture but who are still active with their native culture can demonstrate that embracing two cultures is possible and can lead to a richer life filled with more treasured cultural experiences than a single culture could produce. Teachers who are sensitive to their students' unique cultures will be able to relate to the students more easily, leading to more successful instruction and more fulfilled students willing to embrace both a new language and a new culture. "ESL Classroom and Cultural Sensitivity." YourDictionary, n.d. Web. 21 April 2019. <https://esl.yourdictionary.com/lesson-plans/esl_classroom-and-cultural_sensitivity.html>. There are many ESL classroom and cultural sensitivity issues that teachers must address to ensure they are delivering language instruction without prejudice, discrimination, or bias. By understanding the potential problems with cultural sensitivity, teachers can avoid creating an English-centric classroom while increasing their students’ language skills.